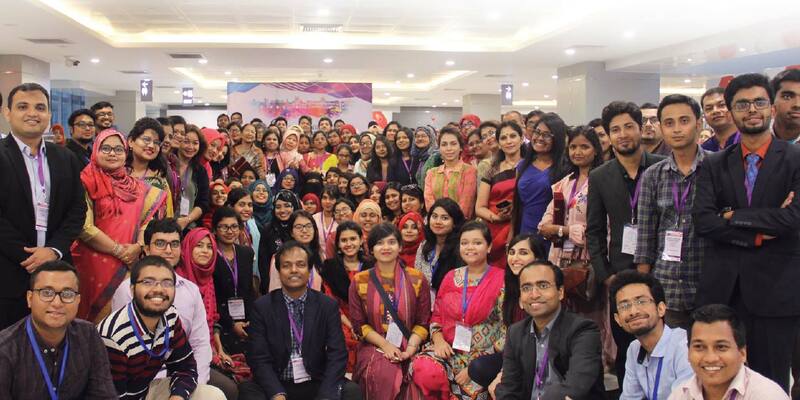 With the theme of “Dream |Believe |Achieve |Empower” IEEE Women in Engineering (WIE) International Leadership Summit (ILS) 2018 was held 12-13 October, 2018 at BSMMU Convention Center, Dhaka with the theme of “Dream| Believe| Achieve |Empower”. 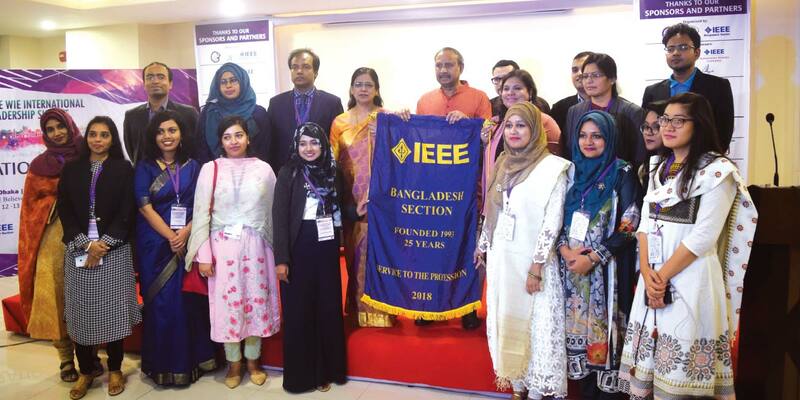 This global summit was organized by IEEE Women in Engineering Affinity Group of Bangladesh which is the first time in the history of IEEE Bangladesh section since its inception in 1993. The first day of the summit started with the brief overview of IEEE Women in Engineering (WIE) Affinity Group (AG) Bangladesh Section. 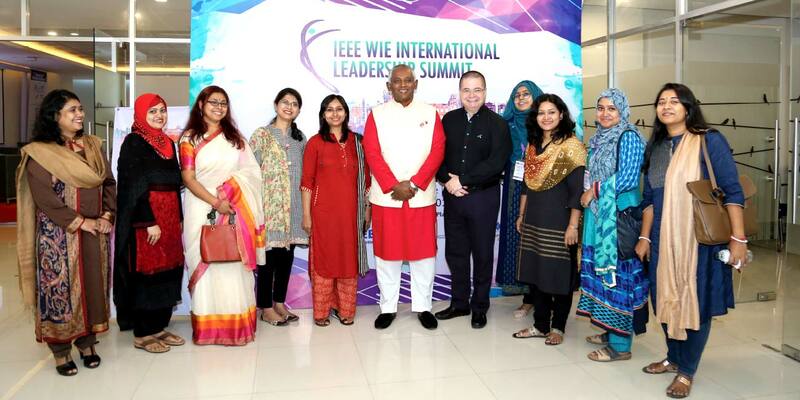 The back ground of IEEE WIE international leadership Summit presented by general chair of the summit, Professor Dr. Celia Shahnaz from EEE department of BUET. State Minister for Women and Children Affairs Meher Afroze Chumki was present as Chief Guest while BSMMU Vice Chancellor Professor Dr. Kanak Kanti Barua was present as Special Guest during the inaugural ceremony. The sessions commenced with a message for delegates from Bozenna Pasik Dunkan, IEEE WIE Chair (2017-18) and her vision for IEEE WIE was presented by General Chair Dr. Celia Shahnaz. Samira Emerson, Analytics and Data Science Director, THE CENTER OF APPLIED DATA SCIENCE, Malaysia delivered the maiden keynote speech at the gala program. This was followed by keynote speeches from Mahtab Uddin Ahmed, CEO and MD, Robi Axiata limited and Michael Patrick Foley, CEO, Grameenphone Ltd. and ended with a panel discussion with the theme: “Embracing Science and Technology to break barriers”. Besides, there were also talks on the challenges faced by women in Entrepreneurship and Leadership roles and how to surpass them successfully. The speakers talked about exciting and innovative ideas for entrepreneurship, emerging medical research customized for women, role of women in national development, role of women in developing sustainable energy, empowering women, and progress of women in various technical sectors. WIE International Humanitarian Technology Project Competition (WIE-IHTPC) was collocated with the summit to inspire more women and female students to be involved in humanitarian technology-based activities. 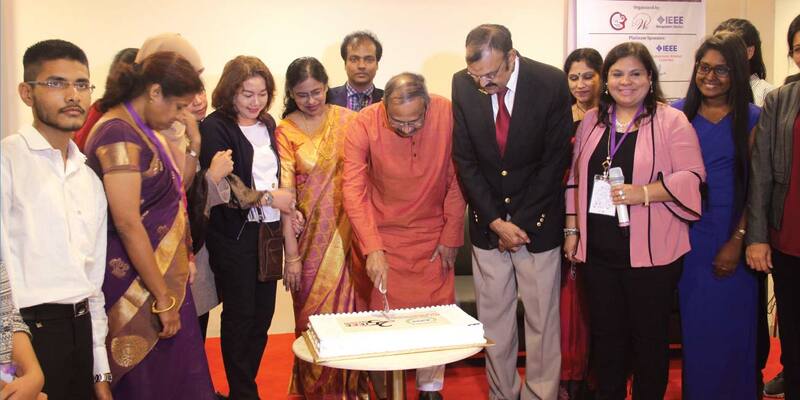 A total of 55 speakers including 13 foreign speakers, 33 WIE –IHTPC participants (19 teams) with 8 foreign participants (5 teams) from 8 different countries, namely USA, Canada, Malaysia, Singapore, Indonesia,India, Sri Lanka, and Bangladesh along with more than 300 delegates, volunteers , press and media journalists took part in the summit. 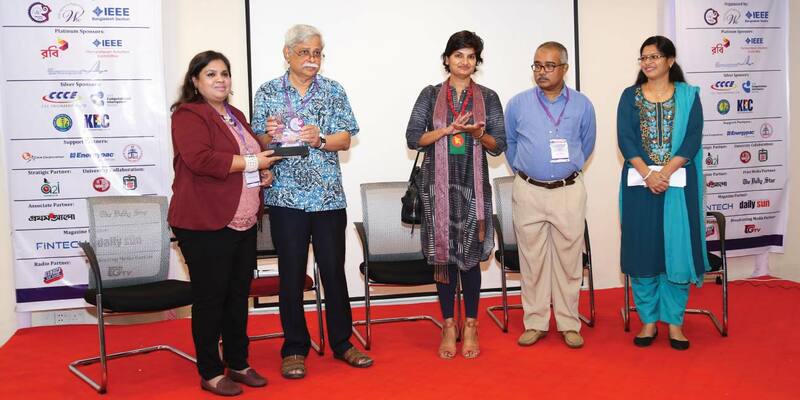 Later in the day were keynote speeches by Prof. Dr. Dil Afroza Begum, Member, United Grants Commission of Bangladesh and IEEE Region 10 Educational Activities Coordinator, Zuhaina Zakaria. The day ended with a grand celebration of “25th anniversary of IEEE Bangladesh section” and winning of “2018 IEEE MGA outstandinglarge section award” in the presence of Architect Yeafesh Osman, minister of Science and Technology as the chief guest and celebration evening keynote speaker. The second day of the summit started with the presence of Rokia Afzal Rahman, President, Bangladesh Federation of Women Entrepreneurs, Agnes Irwanti, Co-founder of Multikom Global Mediatama Company, and Selima Ahmad, President, Bangladesh Women Chamber of Commerce and Industry. 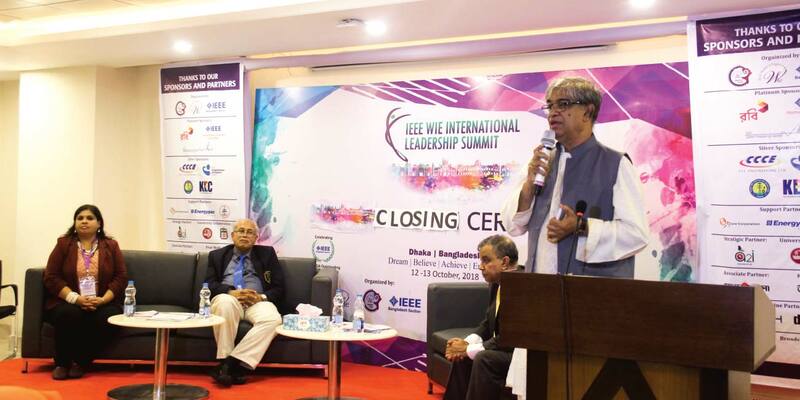 There were a couple of parallel sessions on professional challenges, industry and business engagement, demystifying nuclear power, emerging technology, role of women in computational intelligence along with a workshop arranged by IEEE Humanitarian Activity Committee. An engaging panel discussion was conducted with the theme- “Enhancing communication, mental and technical skills for successful carrier” where Professor M. Zafar Iqbal, Munni Saha and Munir Hasan participated. Afterwards, there were keynote speeches presented by Malika Meghjani, Post Doctoral Scholar Future Urban Mobility, Singapore-MIT Alliance for Research and Technology, Dr. Nia Kurnianingsih, Coordinator of Electronic Communications and Information Management, IEEE Region 10 and Dr. Suma M S, Professor, Department of Medical Electronics. The event drew to a conclusion with a closing ceremony where Minister of Posts, Telecommunications and Information Technology Mustafa Jabbar was present as chief guest. He shared his thoughts on how women should constantly be empowered and encouraged to achieve more and about how our country has progressed in ensuring a rise in educational and professional opportunities for women. Mr. Abul Kalam Azad, Principal Coordinator, (SDG Affairs), Prime Minister’s Office was also present as special guest with Professor Kanak Kanti Barua and provided thoughtful keynotes. The local arrangement chair of the summit Dr. Shaikh Anowarul Fattah, Professor, Dept. of Electrical and Electronics Engineering, BUET; Education Chair, IEEE Humanitarian Activities Committee and past Chair of IEEE Bangladesh Section delivered a vote of thanks to all the guests, speakers and volunteers for their relentless support and participation. The ceremony ended with the prize giving to WIE-IHTPC winners and celebration of IEEE Day 2018. Mobile operator Robi including IEEE Signal Processing Society, IEEE Humanitarian Activities Committee was the Platinum Sponsor of the event along with Access to Information (A2I) as the strategic partner.